When I started reading, back in the mid-1950s, through to end of my high school days in 1964, there were still dozens of periodicals that published short fiction. Everything from Redbook to Argosy and the Saturday Evening Post were available as outlets for short stories. Today those magazines are gone and with them, to a large degree, short fiction. Happily there is still one mainstay of this literary format still offering up these bite-sized nuggets of story telling and that is the anthology. 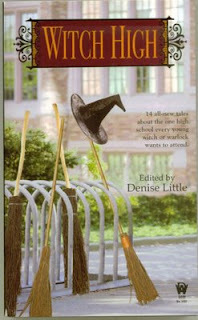 One such collection is WITCH HIGH, edited by Denise Little. The theme of the book revolves around a school for witches, Salem Township Public High School # 4. As most of us will attest, surviving high school is a rite of passion all Americans have had to endure and the experiences culled from those four years often times set the course, good or bad, for the remainder of our lives. Now imagine having to handle those awkward years and magical powers at the same time. This is the central challenge to the characters in the 14 stories that make up this truly delicious anthology. There is not a dud in the bunch, each deftly written with a keen ear and eye for the angst-ridden lives of the typical teenager in today’s culture. Of the fourteen contributors, I was only familiar with two; Bill McKay and Diane Duane. McKay, oddly enough the only male writer on board, delivers the darkest tale with a poignant, heart-warming end. I’m familiar with much of Duane’s Star Trek fiction and she has the final tale in the book, which caps it all off wonderfully. Other personal favorites included “Domestic Magic” by Kristine Kathryn Rusch and “You Got Served” by Ester M. Friesner. I also appreciated the fact that not all the stories starred the students of Witch High, but several featured the teachers and their daily trials and tribulations. All in all, WITCH HIGH is a place Harry Potter and his chums would feel right at home at, and I believe, so will you. Which is exactly what this is, a time-capsule look back at the glitter capital as it existed back in the 1950s, long before the city powers opted to make it a family-friendly vacation destination. Joe Martin is an army veteran who owns and operates the Rainbow’s End casino without any help from the syndicate. He is an annoyance they want eliminated. They hire a big time gambler named Bello to break the house; that is winning all the casino’s funds in a marathon game of craps. Martin is no naïve rookie and long before Bellow sets foot in his establishment, he becomes aware that an assault is imminent. Martin’s fear is that while he is dealing with the mercenary high roller, the syndicate will attack at him on other fronts. Luckily, Martin has two loyal friends who won’t let that happen. The first is Sprig, his tough chief of security and Mal Davis, a lounge singer/pianist who is afraid his career is going nowhere fast. As the syndicate unleashes its various strategies to bring down Rainbow’s End, both Sprig and Davis soon find themselves soldiers in Joe Martin’s war. Then, as if things couldn’t be more tense, enter Sunny Guido, a beautiful grade school teacher from California who entrances the cynical Martin and first time in his life has him experiencing love. But is she the real deal, or clever plant sent by the syndicate to mess with his mind? I’ve personally never had any desire to gamble nor visit that glitzy city out in the middle of the Nevada dessert. Still, after reading this excellent story, I can better appreciate the fascination of people for this one-of-a-kind sin city. Fisher creates truly great characters and drives his narrative with ease, building suspense slowly until the finale erupts across the last chapter like a breath of much need fresh air. NO HOUSE LIMIT is a gem of a book and I recommend it highly. Readability is a word you don’t trip over every day. Found in the umbrella definition of the word read, it more or less describes the ease or difficulty of any text to be deciphered. I bring this up because there are clearly books whose readability far outshines others such as all of Clive Cussler’s adventure novels. His writing is the literary equivalent of salted nuts, once you eat one, you are compelled to eat more. Beginning with page one of THE NAVIGATOR, I knew I was once again in friendly territory, as these pulp inspired thrillers have been entertaining readers for almost two generations ever since the paperback publication of Cussler’s THE PACIFIC VORTEX, his first Dirk Pitt adventure. That was way back in 1983; the hardback original having appeared the year before. The thing is it was the mass paperback editions that found, via word of mouth, Cussler’s audience and pulled them into becoming avid, lifelong fans. I confess to coming in late on the fun. Several of my writing colleagues had been telling me for several years that Dirk Pitt was the “new” Doc Savage, that most famous of world trotting pulp adventurers. I procrastinated until the release of Pitt’s seventh outing, CYCLOPS. Why that one? Because the paperback cover sported a dirigible and I am just a bonafide sucker for airships. Once I’d read the book, I immediately realized how terrific the concept of Pitt and his NUMA (National Underwater & Marine Agency) was and went out and found the first six and devoured them speedily. Like the pulps they evolved from, Cussler’s books are filled with exotic locations, dastardly villains and near super human heroes who always save mankind just in the nick of time. Each is filled with accurate historical backgrounds, suspense, action humor and imagination beyond belief. Now this kind of rampant success had one drawback. The demand for new stories was never-ending and poor Cussler was, after all, just one man. He could only write so much and still eat, drink and live his life like the rest of us. How could his publishers satisfy the clamor for more without killing the goose who in fact laid those golden eggs? 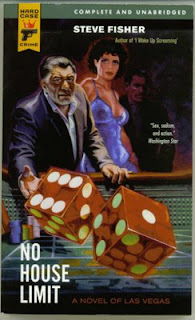 The answer was another pulp standard, create a spin-off series and bring in another quality suspense writer. 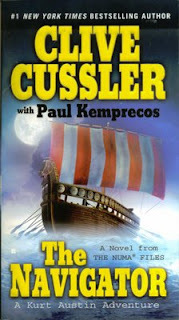 SERPENT was published in 1999 and its credit reads, “Clive Cussler with Paul Kemprecos.” Kemprecos is a professional writer who had written several best selling novels featuring an underwater detective. Thus he was the ideal partner to work with Cussler. Together they invented another NUMA operative in Texas born Kurt Austin, who, although physically different than Pitt, is clearly cut from the same larger-than-life hero mold. There’s even a letter on the book’s first page introducing the readers to this new character and it is signed, Dirk Pitt. I have no inside clue as to how they work, but my guess would be that they develop a plot together and then Kemprecos goes off to do the actual writing. To date there have been six Kurt Austin adventures with THE NAVIGATOR being the seventh. All of them have been just as much fun as the Pitt books and this new one is certainly no exception. These books are formulaic, but unlike other critics, I see that as their strength. Readers know what to expect and are rarely disappointed. THE NAVIGATOR begins three thousand years ago when King Solomon orders Phoenician captain to sail half way around the world to bury a sacred relic whose existence could cause havoc amongst the known civilizations of man. The tale then jumps forward to the last days of Thomas Jefferson’s Presidency and a mission assigned the famous explorer Meriwether Lewis and the beginnings of a secret organization known as the Artichoke Club. What these divergent elements have in common is the puzzle that challenges Austin and his team as he comes to the rescue of a lovely archeologist named Carina Mechadi. In the Baghdad national museum, shortly after the American take-over, Mechadi finds a life-size statue of ancient sailor known as the Navigator. But before she can properly examine it, the statue is stolen by a group of mercenaries working for a mysterious tycoon named Balthazar. What is the secret of the statue and to what purpose does Balthazar intend to use it? THE NAVIGATOR is a convoluted, globe-spanning puzzle that will keep you turning pages late into the night. The pacing never lets up and with each new piece of the puzzle revealed, the excitement mounts exponentially until the slam-bang climax. This is a good as modern pulp gets, and I’m hoping both Dirk Pitt and his pal, Kurt Austin, are going to be around for a long, long time. Pass the peanuts, please. You would have expected the father of America’s toughest private-eye to go out with a bang! 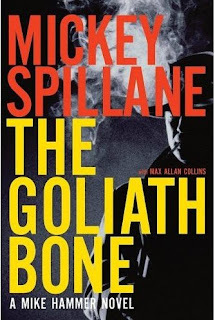 And he does, in this, one of the two remaining Mike Hammer books Mickey Spillane was writing at the time of his death. Thankfully his close friend, and literary protégé, Max Allan Collins was on board to complete them. It’s a loud bang of action, humor and a long fulfilled romance that had me hooked from page one. Nobody wrote tough-guy pulp like Spillane. It was a talent that never left him over his sixty year career as a crime writer. Mike Hammer is out and about on a cold New York City winter night when trouble comes calling in the form of two young people hurrying down the street unaware they’ve picked up a menacing shadow. Never one to mind his own business, Hammer takes off after them and their mysterious pursuer and arrives in the nick of time to save them from being gunned down. Hammer never goes anywhere without his trusty Colt .45 automatic. With a dead man at his feet, and two frightened innocents, Hammer whisks them off to the security of his office and thus the tale begins. The would-be victims are college sweethearts recently returned from a trip to Israel. After camping in the Valley of Elah, the two accidentally uncover a human femur bone the size of a railroad tie. They believe it to be the only remains of the biblical Philistine giant, Goliath. The couple, Mark and Jenna, smuggle the bone out of the country by mailing it to a friend back home. Once back in New York, they retrieve it and are on their way to the university to deliver it to their respective parents who are both archeologists. Thus ends their tale at the point of being attacked by the unknown assassin and Hammer’s timely appearance. Hammer immediately realizes the political implications of their discovery and the dangers they entail, to include the botched murder attempt. But worry not, pulp fans. Before the two can sail off into the sunset, there is still the matter of a ruthless killer who has left a trail of bodies for Hammer to follow like a grisly invitation to a climatic showdown. Mike Hammer never walked away from a case until justice had been meted out; the kind dispensed from the barrel of his .45. THE GOLIATH BONE is no exception. This is one hell of a ride you do not want to miss!